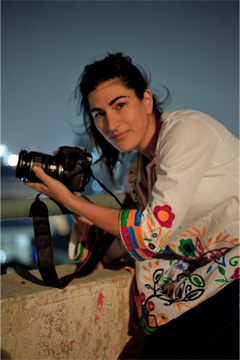 TWE Interview: Jehane Noujaim Faces Chaos in Cairo to Film "The Square"
UPDATE 8/17/14: Jehane Noujaim wins two Emmys for her documentary The Square, which won 3 Awards at the Creative Arts Emmys 2014! Jehane won the Emmy for Outstanding Directing for Nonfiction Programming. 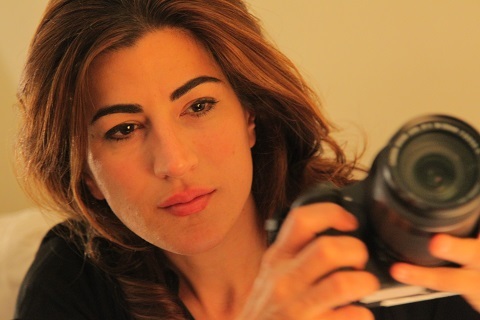 Noujaim was awarded a second Emmy Award for Cinematography for Nonfiction Programming along with her other three Directors of Photography: Muhammed Hamdy, Ahmed Hassan and Cressida Trew. The editing team for The Square—Pedro Kos, Christopher de la Torre and Mohamed El Manasterly—were awarded an Emmy for Outstanding Picture Editing for Nonfiction Programming. Congratulations, Jehane and The Square team! UDPATE 1/25/14: Jehane Noujaim wins Directors Guild of America award for The Square. 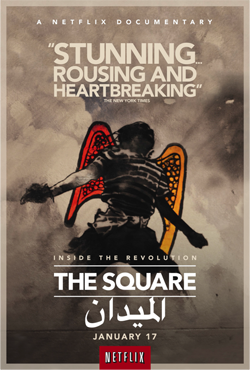 UPDATE 1/16/14: Netflix ‘original’ documentary The Square lands Oscar nomination. Jehane Noujaim is an Egyptian-American director currently on the Oscar shortlist for The Square, her fifth feature-length documentary. For two years, danger and chaos were part and parcel of her quest to chronicle Egypt’s 2011 uprising in Tahrir Square. Undaunted, Jehane (@JehaneNoujaim) and her team followed the emotional stories of activists Ahmed, Aida, Khalid, Magdy, Ragia and Ramy. EYE: What do you want audiences to take away from The Square? JEHANE: Filming cinema verité allows an audience to feel like they are actually experiencing a situation live. It’s the closest thing you can get to time travel, really. If audiences can feel like they experienced a revolution live, experience being in Tahrir Square and what it felt like to be in the shoes of Ahmed, we will feel like we would have accomplished something. I also want people to think about what is the zeitgeist of the time. Young people occupying squares all around the world are asking for a redefinition of the relationship between themselves and their government. There is an interconnectedness between what’s happening in Cairo, Greece and different areas of the Arab Spring. EYE: Have you gotten any feedback illustrating the impact you are hoping for? “I felt so alive after watching this film. I have never followed what’s been happening in the Middle East or their politics. This is about a group of people, a young guy’s struggle for freedom against all odds and his desire to put everything on the line to fight for what he believes in. That to me was everything that I want for someone to take away from this film. EYE: All the characters have high stakes. Is there a particular moment that defines the film for you? JEHANE: One very powerful moment occurred when Ramy, an unknown singer before he went to the square, took his guitar, went up on stage and made the chants into songs of the revolution. He garnered a massive following, both in the square and online. After Mubarek stepped down, Ramy and the others we followed in the film stayed after everyone else went home. At that point in time, the square was cleared, and Ramy was arrested and taken to the Egyptian Museum where he was brutally tortured. He literally spent weeks in bed recovering from being electrocuted, beaten and hung by his hair. The next time you see him in the film, he is standing up on the stage singing because there had been massive atrocities done by the Army. I watched him as he stood up on stage, knowing what he’d been through. The Army was coming into the square at that moment by the hundreds and thousands and you’re watching this and you wonder how does this guy have the incredible guts, perseverance and absolute belief in his duty to stand there. Ramy knows that what he is doing is inspiring and motivating people. It was an outstanding moment when I was just completely amazed by people’s resilience and refusal to back down from their principles. JEHANE: I made this film with an incredible, collaborative team, and I grew up in Cairo about ten minutes from Tahrir, so I knew the area well. We were using Canon cameras that weren’t confiscated because the Army thought they were just still photo cameras. But we also needed separate sound recording. So we were all part of a team at all times, meeting together each morning in the square, men and women. There were four cameras there at the same time. It was like Ahmed said in the film, “We loved each other without really knowing each other.” So, there was this beautiful watching out for one another at all times. EYE: Andrew Romano in the Daily Beast called the film ‘the year’s most dangerous documentary.’ Did you feel scared for your life at times? JEHANE: There were definitely very scary moments. Generally, violence would happen and you would get stuck in situations with tear gas flying and it would be difficult to get your bearings. Things would erupt all of a sudden. I come from a certain privilege that people would be able to get me out of prison if I were arrested. But, I was standing alongside people, who, if they were arrested could spend months in prison. They had a lot more to lose than I did. There was something hugely empowering and inspiring about that and somehow that removed the fear. EYE: When you decided to do The Square, did you anticipate the danger, the violence and the outcome? JEHANE: I had no idea what was going to happen. I don’t think anybody did. That’s the case with every verité film. I made my first film with D. A. Pennebaker and Chris Hegedus, who are incredible documentary filmmakers and whose work I adore. Chris used to say, you walk into it, you have a storyline in your mind, but that’s often your storyline that you make up. Ultimately that plan usually gets completely derailed. There’s a saying, “Make a plan and God will laugh!” Everything was very much in the moment. We were reactive, rather than proactive. We were reacting to events and trying to keep up, following the emotional story of the characters as closely as we could. There were many surprises and twists and turns that the story took. Oftentimes because the story was so immediate and being in the square, you see and feel like you are in an action movie. That may be another reason The Square appeals to youth; it has action movie elements and fighting for a better world. The Square is also breaking the narrative stereotype of the Arab terrorist or the oppressed Arab woman. I went in with many more questions than answers that I wanted to prove. EYE: What intrigues you about documentary directing? JEHANE: Being a director gives you the opportunity to be in situations that you would never otherwise get to experience, deeply. I can decide to trail a doctor and have the experience of being in an operating room without ever having gone to medical school. What a gift to be able to “live” different lives. I find directing a lifelong, continual learning experience, which is exciting. EYE: Did you always know you wanted to direct? JEHANE: Not at all. A glimpse of it came when I was young. I always loved photography. It’s something inside you. As a kid I was always the one whom they handed the camera to at weddings and then told to take good pictures. I also loved the idea of being a doctor, being able to help people in need, so I went to Harvard and was a pre-med student. I realized quickly after taking Organic Chemistry that other people are better suited for this. I was obsessed with the film and photography classes I was taking. My mother is a wonderful wise person who said that you are never going to be good at anything unless you absolutely love it. And, I knew I loved what I was doing with film and photography. I had incredible mentors there, which allowed me to begin this path. EYE: There is talk that you could win an Oscar for this film. What would that mean? JEHANE: The Oscar sometimes feels very far away from the ideals we were filming and fighting for in making this film. Yet, when Ahmed heard the news of being on the shortlist, he said, “I wanted to yell and shout and run through the streets because this means that the story that we’ve been fighting for, we’ve been telling, the values and the change we’ve been fighting for will never be obliterated.” Our narrative will never disappear. As it is said in the film, “This is not just a story of rocks and stones; this is the battle of the narrative.” The country is so divided and both the Brotherhood and military try to whitewash the past. It’s a very crucial time in Egypt when there is a vote for a new constitution. There will be a Presidential election this upcoming year. Our film has been in censorship for over two months. We’ve been waiting for the letter of authorization to show it to a wide public in Egypt. That is most important. Because of the writing that’s been coming out, the Oscar shortlist and potential nomination, hopefully all that will push the film out there. An Oscar would get it into the international conversation, not just the red carpet. EYE: Financing a film project must be a huge endeavor. I understand you used Kickstarter to fund some of The Square? JEHANE: Oh yes! We have all the donators credited on the film. It was a crucial moment when we desperately needed funding so we decided to do a Kickstarter campaign. It was so important for a film like this, which was made by a collaboration of filmmakers about a people’s movement. There was no better way to find funding for this than by groups of people donating. EYE: What is on your next list now? JEHANE: I do hope this film can be distributed as widely as possible around the world, especially in Egypt and the Middle East. We filmed 1600 hours of footage which included human rights lawyer Ragia Omran, an “Erin Brokovitch” who gets protestors out of prison. I think she would be a great documentary subject. And, I am talking about fiction with some people. EYE: What advice do you have for documentarians-to-be? JEHANE: It’s very simple. Film a subject and people that you love, that surprise you, that you are fascinated by, subjects that you wake up excited to film. There will be ups and downs and there will be times when there will be frustration. But it has to begin with a deep love and fascination for the subject. EYE: What about aspiring young women directors who are entering a traditionally male arena? JEHANE: Success happens when you keep beating your head against the wall. A horrible image. But I think a lot of the most successful documentary women filmmakers I know don’t give up; they keep on trying. The only way you can keep trying is when you know in your heart that you’re following something that you care about deeply and needs to be shared with the world. EYE: Jehane, thank you for sharing your limited with TWE. We will all be looking forward to more of what you want to share with the world. The Square debuts on Netflix and in select theaters, January 17, 2014. For more information, visit their website.